Don't be afraid of phyllo dough. I stocked up on some when it was on sale at Giant Eagle a few months ago. In my current quest to cook more seasonal recipes, I bought some rainbow Swiss chard. I've also been looking for recipes that I can make one day and will leave leftovers that reheat well the next day. 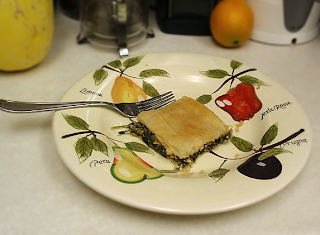 I found this recipe for Swiss Chard Spanikopita at myrecipes.com. I adapted it to use what I had in my fridge at the time; the recipe is listed below. I really liked this dish and so did Rob. It was really easy to prepare and only used 2 pans, one to saute the ingredients and one to bake it in the oven. We ate this as a main dish one night, then I brought some into work for lunch the next day, and the day after I served the rest as a side dish alongside some fish. The recipe is definitely a keeper. Preheat oven to 375F (was probably closer to 350F, but my oven temp is off so I usually turn if up about 25 degrees higher than listed on recipes). Heat a large nonstick skillet drizzled with EVOO over medium-high heat. Add vidallia and shallots; saute 7 minutes or until golden. Add scallions and garlic, and saute 1 minute. Stir in chard and baby spinach; cook 2 minutes or until chard and spinach wilts. Stir in parsley and mint, and cook 1 minute. Place in a large bowl; cool slightly. Stir in cheeses, salt, pepper, and egg plus egg white. Spray a 13 x 9-inch baking dish with cooking spray. Place 1 phyllo sheet in the bottom of the pan. Spray sheet with cooking spray. Top with another sheet of phyllo, coat with cooking spray, repeat. Continue layers until you have layered 5 sheets of phyllo in total. Note: Don't worry if the sheets rip as you're layering them, no one will notice, just try to piece them together to make a full layer if you have to. Trust me, it will still taste delicious :) As an alternative, you can use the butter topping spray instead of cooking spray between the layers, or if you want something a bit richer, you can brush the sheets with melted butter. I like the ease of using cooking spray and don't miss the extra calories using melted butter adds. 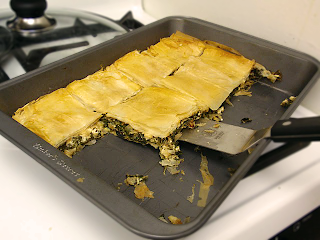 Now, take the Swiss chard and spinach mixture and pour it on top of the phyllo layers in the baking dish. Spread the mixture evenly around the baking dish. Top the mixture with 1 sheet of phyllo, coat the sheet with cooking spray and continue layering phyllo sheets and cooking spray until you've used up the remaining phyllo sheets. Note: I forgot to cover my remaining to prevent them from drying, so a few sheets didn't make it into the dish, but it still turned out fine. Once you've layered all the remaining phyllo sheets, spray the top of the spanikopita with butter topping spray and score the phyllo with a sharp knife to make 12 rectangles (3 x 4). Place the baking dish in your preheated oven and cook for 30-40 min until the top is golden. Distribute rectangles to eagerly waiting friends and family.